Cross County Shopping Center | Events | The Play Area is OPEN! The Play Area is OPEN! THE LUCKEY CLIMBER IS OPEN FOR PLAY TIME! 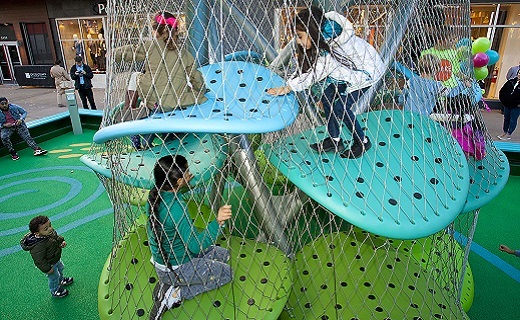 The NEW Luckey Climber play structure is a combination of fun and education, where kids of all ages can create their own play games while climbing a beautiful structure. Kids can play hopscotch with pre-drawn footprints on the colorful floor, play hide and seek within the structure or climb to the top in just minutes! Plus, parents can watch while sitting on colorful benches and take advantage of FREE phone charging stations too. Visit the Luckey Climber located near Old Navy. Learn more about Luckey Climbers HERE.